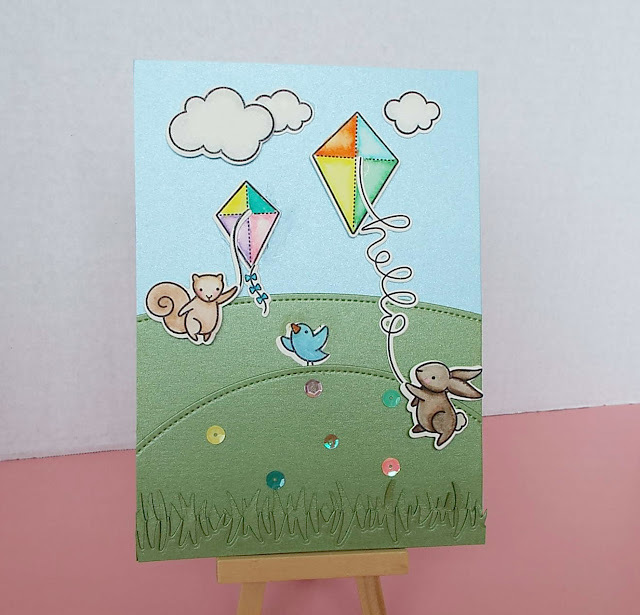 Dies R Us: Let's Go Fly a Kite! Hi everyone, Deanna here with another fun card to get your creativity going. Here is what I have for you today. My project was created using the new Lawn Fawn Yay, Kites! stamp and die sets from Dies R Us. My card base is white card stock that I cut and folded to make a 5" X 7" card base. Next I cut some blue card stock for my sky. The blue card stock was cut at 3 1/2" X 5". For my lawn and grass I cut two pieces of green card stock at 3" X 5". I ran these two pieces through my Big Shot machine and cut them using the Lawn Fawn Simple Stitched Hillside Border Dies. Next I took another piece of the green card stock that was about 1" X 5" and cut my grass using the Lawn Fawn Grassy Border Die. Next I stamped, colored and die cut my images from Lawn Fawn Yay, Kites!. I decided to use the Hello sentiment as a kite string held by the bunny. Just an FYI, the Lawn Fawn Big Scripty Words stamps and dies can also be used as kite strings or just as a sentiment. To finish my card I added some different colored sequins to look like little flowers growing in the grass. at 12:00 AM Labels: Deanna, Dies R Us Big Shot Machine, Lawn Fawn Grassy Border Die, Lawn Fawn Simple Stitched Hillside Dies, Lawn Fawn Yay Kites! This is such a fun card! You have created a great scene and I love the stamp and die set you have used. So, so cute Deanna! This card could be used for so many occasions and ages! Well done! So stinkin' cute! Your critters are just the cutest! Loving those stitched hills. This is put together perfectly! Love it! Great coloring on your stamps, Deanna. Very cute scene. Adorable, love your coloring of them, fun summer scene! Awww Deanna, this is as cute as can be! Great coloring on those sweet little critters!! OMG, I love your card and your coloring is so neat!